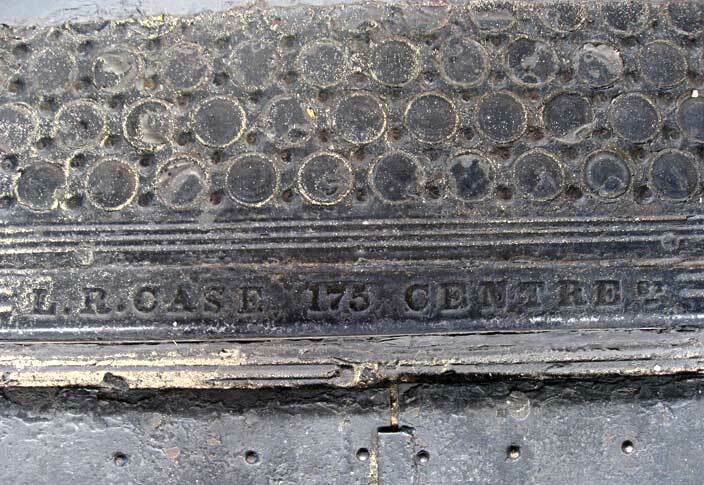 L. R. Case - 175 Centre St.
Lewis R. Case (1820-1912) appears to have been a grocer in New York city in the 1840s, then moved into window shades and paper hanging before becoming a manufacturer of iron furnaces and vault lights around 1858. He is listed in the New York city directory in 1859 as a partner with Joshua K. Ingalls, located at 175 Centre St. and 159 Hammond St. According to their entry that year, Ingalls & Case manufactured "patent lights, self-locking vault covers, air-forcing furnacing, &c." Case was awarded a "Diploma" by the American Institute of the City of New York for a "portable furnace" he exhibited at their annual fair in 1857. His business was located at 175 Centre St. from 1859 to 1861, after which L. R. Case moved to 109 Mercer St. (1862), then 5 Worth St. (1864). There are at least four examples of L. R. Case vault lights in New York. At 73 Franklin St. there is another with the address 175 Centre St., and there are two others with the address 5 Worth St. One of these is found at 427 Broadway on the corner of Howard St. (click for image). Both Case and Ingalls had connections with the town of Southold, Suffolk County, NY, on Long Island. Case was born in Southold, and the following notice appeared in a publication called The Universalist Union in 1846: "Married in Southold ... by the Rev. J. K. Ingals [sic] in the Universalist Church, October 13, Mr. Lewis R. Case and Miss Ency S. Corwin." Case made vault lights on Worth St. from approximately 1864 to 1873. 1873 was his last entry in New York city directories. In the 1880 U. S. census, he lived in Peconic, Suffolk County, NY, and gave "farmer" as his occupation. The 1870 U. S. Census (non-population schedules for manufacturers) recorded L. R. Case, Vault Lights. He owned $5000 in real capital and raw materials consisting of iron, glass, etc. worth $8000. He employed an average of 12 hands and paid annual wages of $10,800. His machinery consisted of 5 hand-driven lathes. Yearly production of vault lights was valued at $27,000. Case's partnership with Joshua K. Ingalls (1816-1899) seems to have been sporadic. During the 1860s Ingalls had at least one other business (dealing in oils) and possibly served Case as an agent rather than a full partner. Ingalls had a grandson, Charles Arthur Ingalls (1870-1949), who was considered sufficiently prominent to warrant an entry in a local history entitled Staten Island and Its People: A History, 1609-1929, by Charles W. Leng (published in 5 volumes 1930-1933). The following quote from this work summarizes Ingalls' life: "Joshua King Ingalls was born in Swansea, Massachusetts, July 21, 1816 ... After becoming educated for the ministry ... he was pastor of houses of worship in ... Southold, Long Island, Danbury, Connecticut ... and Marietta, Ohio ... [Later] he ventured into the business of manufacturing vault lights. Previously he had worked out a plan which enabled him to improve the making of vault lights, which though already manufactured under a patent, greatly needed further improvement. These street vault lights were a heavily-molded glass set in steel frames which reflected the sunlight into basements under sidewalks. For a time he conducted a business under the firm name of Ingalls and Marks [sic], but afterwards he removed to Central New York State and settled near the shore of Seneca Lake." Joshua K. Ingalls was a prolific author. An extensive bibliography can be found at the website Libertarian Labyrinth. This source also lists patents filed by Ingalls, including several relating to vault lights. More about Joshua K. Ingalls will be found on the Jacob Mark page. 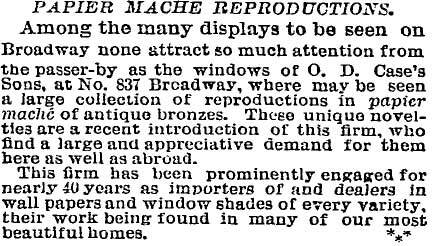 From approximately 1849 to 1857 Lewis R. Case was in business with Orrin D. Case at 324 Bowery as window shades and paper hangings. After 1857 Lewis R. Case became a manufacturer of iron products, and Orrin D. Case continued in the paper hanging business on his own. Orrin D. Case (b. ca.1820, d. 30 April 1874) may have been Lewis R. Case's brother, but I have not been able to establish the relationship. In any case, their careers in business seem not to have crossed after 1857. Orrin D. Case, either "hangings" or "shades" was in business on the Bowery from 1858 to 1873. On Orrin Case's death in 1874, the business name changed to O. D. Case & Son at 344 Bowery. The son was Gilbert D. Case (1852-1930), who continued the business until 1911. In its later years O. D. Case's, Sons, at 7 W. 19th St., was described as "Decorators." Orrin Case is found in the 1860 U. S. Census (as Aaron Case), age 39, born New York, "Paper Hanging Store." His son, Gilbert, was 8 years old. In the 1870 census Orrin Case was 49 years old, born New York, "Paper Hanger." Gilbert Case (recorded as Hubert) was 18, "Clerk in Store." By the time of the 1880 census, Orrin Case had died, and Gilbert Case lived at 61 W. 39th St. He was now 28 years old, and his occupation was "Paper Hangings." In 1900 Gilbert Case lived at 102 W. 92nd St., Manhattan, with his wife, Mary, and two adopted sons, Horace S. Fish, age 15, and Gilbert D. Fish, age 7.